Uncertain Future For Obamacare Leaves Insurance Companies In Limbo : Shots - Health News While Washington ponders the future of the Affordable Care Act, health insurers need to decide right now what to charge people for health insurance in 2018. "It's insane," says one CEO. 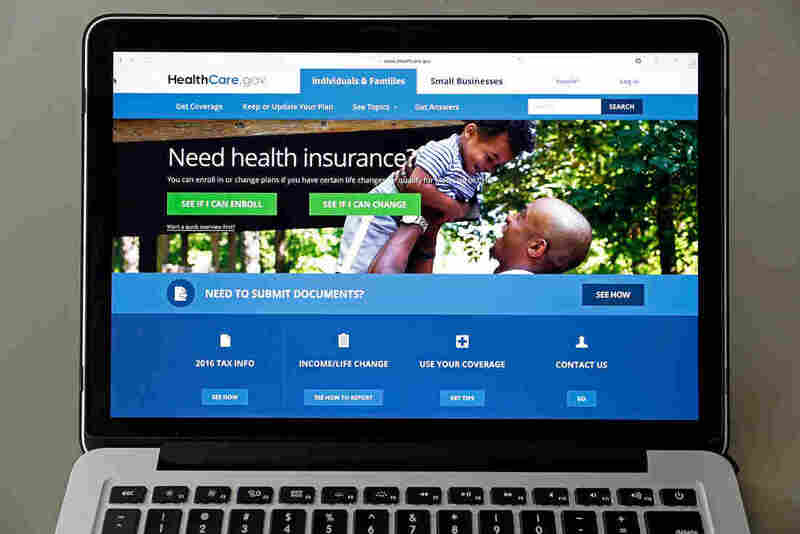 California's Obamacare exchange scrubbed its annual rate announcement this week, the latest sign of how the ongoing political drama over the Affordable Care Act is roiling insurance markets nationwide. "It's insane," says John Baackes, CEO of L.A. Care Health Plan, which has about 26,000 customers on the California exchange. "Here we are in the middle of July, and we don't even know what rules we will be operating under for open enrollment. It is not how you want to run a business." Individuals could face sharply higher premiums and fewer choices if more health insurers leave the insurance marketplaces because of lingering uncertainty. State and industry officials around the United States are concerned that the federal government could stop funding so-called cost-sharing subsidies that reduce out-of-pocket costs for people with lower incomes. And they worry the Trump administration won't enforce the individual mandate that requires people to purchase health coverage or pay a penalty. Amid those concerns, there was a sense of relief Tuesday among many exchange officials and insurers after the U.S. Senate's latest attempt to replace the Affordable Care Act failed. Two large insurer trade groups bluntly warned last week that parts of the Senate plan were "unworkable" and could plunge the market into chaos. In a letter to the Senate, America's Health Insurance Plans and the Blue Cross Blue Shield Association particularly objected to an amendment by Sen. Ted Cruz, R-Texas, that would have allowed insurers to sell bare-bones health plans to people who wanted cheaper premiums. That provision, the insurers said, would split the market between the healthy and the sick, driving up costs for people with pre-existing conditions. However, the Republicans' failure to pass that replacement plan did not resolve questions swirling around the current health law. Tuesday, President Trump expressed disappointment in the outcome in the Senate, telling reporters, "We'll let Obamacare fail and then the Democrats are going to come to us and they're going to say, 'How do we fix it?' "
Sen. Lamar Alexander, R-Tenn., chairman of the Senate Committee on Health, Education, Labor and Pensions, says he plans to hold hearings in the coming weeks on ways to shore up the individual insurance market. Lawmakers may look at creating a new stabilization fund that helps compensate insurers for higher-cost patients. Such a fund would be similar to one that existed during the first three years of the Affordable Care Act exchanges. "We are running out of time, and we need a resolution on what we are charging for 2018," says Gary Cohen, vice president of public affairs at Blue Shield of California in San Francisco, the largest Covered California insurer by enrollment. Cohen, who helped launch the exchanges in 2014 as an official in the Obama administration, noted that the Republican bills in both the House and Senate included money for reinsurance that can help lower premiums industrywide. Those provisions are among the "immediate steps Congress and the Trump administration need to take in order for markets to provide coverage that is affordable," Cohen says. Lawmakers could also appropriate federal funds for the cost-sharing subsidies, which have a price tag of about $7 billion a year. Those payments, made directly to insurers, help reduce deductibles and other out-of-pocket costs for policyholders who earn up to 250 percent of the federal poverty level. This year, that's up to about $29,000 for an individual or around $61,000 for a family of four. More than half of the people enrolled in exchanges nationwide qualify for this financial assistance. Without it, many people would face annual deductibles of $2,000 or more when visiting the doctor or undergoing medical tests. That would make people far less likely to sign up with participating insurers. Conservatives generally oppose the subsidies, calling them a bailout of the insurance industry and arguing that the Obama administration didn't have the authority to pay them. Trump has repeatedly threatened to cut off those cost-sharing subsidies as well. With the future of cost-sharing subsidies up in the air, some states, including California and Pennsylvania, have allowed insurers to submit two sets of proposed premiums. One filing reflects continued federal funding of those subsidies, and a separate one assumes they are eliminated and their cost is included in health plan premiums. In Pennsylvania, premiums next year without the subsidies would increase by an average of 20 percent, compared with 9 percent if they remain intact. Pennsylvania Insurance Commissioner Teresa Miller says the market in her state would be in good shape were it not for the uncertainty over federal policy. "The only thing right now keeping everyone on edge is what's going to happen in Washington, D.C.," Miller says. "If things calm down in D.C. and if we don't see further changes, then Pennsylvania's market really is stabilizing." On Tuesday, Covered California officials said the two different rate filings its health plans submitted will be released Aug. 1. The exchange may announce that same day what the final premiums are, or it could postpone the decision for several more weeks if Congress has begun to pursue fixes to the ACA. "This decision is based on the ongoing federal uncertainty around the repeal and replacement attempts of the Affordable Care Act and the dramatic potential impacts such uncertainty has on the rates and on California consumers," exchange officials said in a statement. A recent analysis commissioned by Covered California estimated that premiums for silver-tier plans would jump by 16.6 percent if the federal government stopped paying cost-sharing subsidies. That would be in addition to normal increases meant to cover rising medical costs. An exchange spokeswoman declined to comment further Tuesday, citing the ongoing developments in Washington. In the Florida exchange market, health insurers have sought an average rate increase of nearly 18 percent. But Florida Blue, the state's largest health insurer, said those rates would go even higher if the cost-sharing reduction payments disappeared. Robert Laszewski, an industry consultant in Virginia and a frequent ACA critic, said the exchange markets aren't imploding, despite what the Trump administration has often said. But their premiums will continue to rise unless more young and healthy people are persuaded to buy coverage, he said. "I think most insurance companies will at least break even, or even make a profit, in 2018," Laszewski says. "Coverage will be 'stable,' but it will stabilize at a horrific premium rate level." Eric Whitney of Montana Public Radio, Abe Aboraya of WMFE and Ben Allen of WITF contributed to this story. This story was produced as part of a partnership with Kaiser Health News, a nonprofit health newsroom and editorially independent part of the Kaiser Family Foundation.